Organic Cotton Yoga Mat - Made only with 100% Organic Cotton! If yoga movement and meditation is to be successful, it must happen in a peaceful, comfortable space. Our 100% organic cotton yoga mat provides a safe and comfortable surface on which to orchestrate the poses. It's also great for Pilates exercise and Massage. An environmentally friendly eco yoga mat. 100% organic, 7oz. unbleached, chemical-free cotton shell. 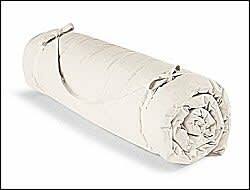 Stuffed with 8 pounds of 100% organic, pure, natural, untreated cotton batting (total weight approx. 10 pounds). Hand tufted to provide the ideal place from which to embark on your inner journeys. Convenient shoulder strap for easy carrying to class. Attached ties for easy roll up and storage. Size:3' x 6' x 2"
Also available is a 100% organic, 7oz. cotton protective slip cover. Due to sweat, dirt and skin oils, this easily washable cover will protect your mat and keep it clean.